At the end of a term, I usually write an article that’s sort of a review of the reactions I’ve gotten from people about the last ten articles I’ve written. But this term it’s been more of the same: patronizing emails from people that claim, with a thick air of superiority, that they know “the truth,” and that I’ll be proven wrong when space aliens reveal themselves to mankind, mixed in with a grab-bag of vulgarity and people claiming that my close female relatives may or may not be employed in exchanging sexual acts for money. But you’ve seen all this before, and that’s why I’ve decided to do something different, something more useful to you, the reader. I’ve compiled a list of simple things that you can do to prevent being abducted by space aliens. Whether or not UFO enthusiasts like to admit it, the alien abduction phenomenon as a whole is clearly affected by science fiction from the turn of the 20th century. For instance, abductees still infrequently report being abducted by aliens wearing what look to be old-fashioned diving suits, the kinds with the big bell-shaped helmets; this is surely a product of the fact that early stories about space travel had a nautical theme to them. In any story from these years, aliens can be killed. 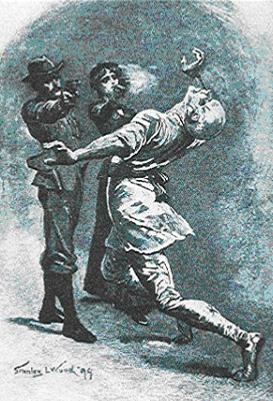 In 1929’s The Conquerors, by David Kelly, the alien ambassador is shot through the heart and killed by a secret service agent as he approaches the President in a “menacing” manner. In Honeymoon in Space, by George Griffith (who at the time was more popular than HG Wells or Jules Verne) a husband and wife travel to Mars, where they meet a race of giants with extremely large craniums. Sound familiar? It should, it’s part of where our modern vision of aliens as lightbulb-headed gray men comes from. Anyway, the sight-seeing duo send a Martian to the grave quite quickly and quite efficiently with the aid of a revolver. I’m sure you’re saying “sure, that works in literature, but what about real life?” The same thing applies here. In the 1950s, a farm in Kentucky was besieged by the so-called Hopkinsville Goblins, tiny monsters that came out of a flying saucer. The inhabitants of the farmhouse managed to keep them at bay with the help of a shotgun and a .22 pistol. A few decades later in California, a terrified teen was able to keep several aliens and their pet robot from capturing him by firing arrows at them from the safety of a tree. Advice: buy a .38 revolver. Revolvers are more reliable and less prone to mechanical breakdown than automatics, and a .38 is just the right size for any user. In A Honeymoon In Space, a lot of aliens get what's coming to them. For instance, this Martian. I guess it's true what they say: when guns are outlawed, only eccentric millionaires, their wives, and the engineer responsible for building their spaceship will have guns. A growing number of people that claim to have been kidnapped by space aliens are beginning to report religious overtones to their experiences. Some UFO enthusiasts, such as Joe Jordan, a State Director for the Mutual UFO Network (MUFON), claim that UFO researchers in general are trying to cover up the ties between religion and UFO abductions. His reasoning goes something along the lines that UFOs are inhabited not by space aliens, but rather by demons whose goal is to pave the way for the coming of the Anti-Christ, and that other “major researchers” are sitting on this information because they don’t want to look crazy. Mind you, he’s claiming that people that believe in UFOs are doing something because they don’t want to look crazy. Well, mission accomplished. Anyway, what does this mean for you? Let’s assume that for some reason when the space aliens first appeared to you, you were too slow or nervous to shoot them. Well, intense prayer is the next best thing. Jordan reports that a man who was almost abducted by space aliens (of course the man is anonymous) claimed that aliens were floating him up to their ship when he cried out “Jesus, Jesus, Jesus!” This apparently hurt the aliens, either physically or emotionally, and they let him go. They just dropped him right back on his bed. Ever have one of those nightmares where you’re too scared to speak out loud? Afraid that an alien abduction might similarly inhibit your speaking abilities? Worry no longer! Some abductees have reported that you don’t need to say anything out loud, that just thinking will provide the same affect. For instance, several abductees have claimed that the alien “mind control” which makes you their plaything can be effectively broken by thinking of religious figures. One claimed that holding an image of Jesus in her mind was sufficient to break the aliens’ control over her, while another claimed that imagining the Archangel Michael, the great holy warrior, was far superior in breaking the mind-control. 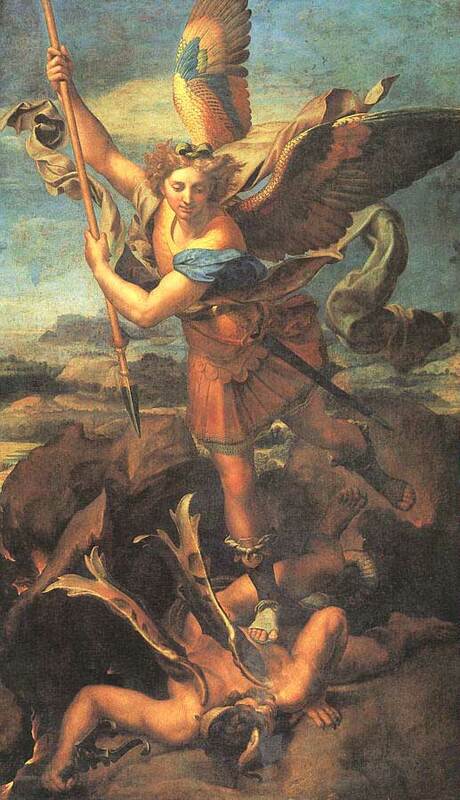 Advice: keep a print of Raphael’s Archangel Michael Slaying Satan on you at all times. If that doesn’t inspire you to foil some alien plans, nothing will. In fact, here's a copy for your own use. Print it out and keep it by your bed. On a number of occasions, aliens have given up on abducting people apparently because their feelings were hurt. The abductees are always afraid, of course, but if they begin to actively imagine harming the little gray men, the aliens seem to get nervous and let them go. I suspect that the reasoning behind this goes something along these lines: aliens are pretty much widely believed to have psychic powers. Dr. David Jacobs, author of (among other things) The Threat, describes a technique that the aliens use to read minds called Mindscan, where they use the optic nerves to stimulate the brain. It’s only logical that if your brain is full of images of the terrible violence you’d like to visit on the little jerks, and that they can see them as though they were real, they might be upset and let you go. I further suspect that this is the reason that so few Marines are ever abducted by space aliens. The meek may inherit the earth, but the extremely violent will never take an unwilling ride in a spaceship. Advice: keep thinking about the opening scene to Saving Private Ryan, but replace all the Germans with space aliens. #4 – Weekend at Bernie’s. Seriously. So the space aliens have an elaborate, top-secret program where they kidnap people for nefarious purposes. However, they’re a bunch of bumbling dumbasses. People have reported being able to wander around the ship, look into whatever rooms they want, fiddle with the controls, all sorts of things. If people have, just by accidentally wandering around the ship, found hangers for smaller craft, the barracks in which the aliens live, nurseries, scientific laboratories, and so on, I’m sure that if you put your mind to it you could wander off from your abductors and find all sorts of cool stuff. Sure, maybe my advice wasn’t able to prevent your abduction, but now that you’re here, you might as well know that there’s nothing keeping you from unlocking the many secrets of the ship. Advice: Me? I’d find the cockpit and fly the UFO straight into the sun, but I’m the spiteful type. You might be better off looking for the game room. I bet those little guys play a mean round of pool. You might, if have some sort manner of ailment that has rendered your heart infirm, be shocked to hear that many people who are abducted by space aliens make quite a healthy profit off of it. They write books, some of which are made into movies, give lectures, are the guests of honor at numerous conventions, tour the television and radio circuits, start cults, and so on. If nothing else, they get plenty of attention, and as the Chinese proverb goes, a person fears fame the way a pig fears fat. So if none of my advice was able to help you out, and you still managed to be kidnapped by monsters from beyond the stars, I recommend that you make a giant pile of money off of it. Advice: Start a cult. There’s good money in cults, and you don't have to deal with all the sleazy Hollywood types involved in turning your story into a film. So there you have it. The first three pieces of advice should be more than enough to keep you from being abducted, but if they aren’t, at least you can put your time aboard the flying saucer to good use. I find it odd that two of those three pieces of advice are imagination-related, which to me implies that alien abductions are closely linked to fantasy, but far be it from me to say abductees are mistaking hallucinations or dreams for the real thing, to say nothing of just purely making things up.